Presenting, the Pisco Greyhound, inspired by the drink loved by both gin and vodka drinkers, this Pisco version is made using three different cooking techniques — sous vide maceration, simple syrup infusion, and broiling. Get in the kitchen, break out your cocktail shaker, and get prepared to be rewarded by some Pisco and chill. Combine the Pisco, grapefruit juice, and raw sugar syrup in a shaker with ice. Shake to chill and double strain into a tumbler with ice. 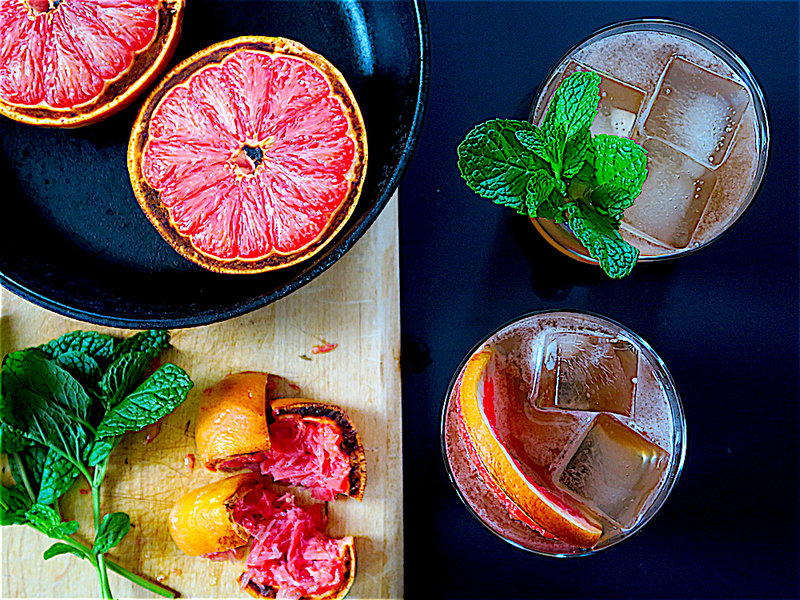 Garnish with a grapefruit round or fresh mint. To make the Pisco maceration, I used a Sansaire sous vide machine and a mason jar filled to the brim with 1 cup of Barsol Acholado Pisco and an orange peel. The sealed jar was submerged in a water bath at room temperature, and the target temperature was set to 75°C. Once the target temperature was reached, I let the Pisco macerate for 1 hour. After removing the jar from the bath, and letting cool, I strained the Pisco into an airtight jar. To broil the grapefruit, cut 2 grapefruits in half and place in a cast iron skillet, facing up. Broil under high heat for 5 minutes, or until the edges of the grapefruit begin to brown. Remove from broiler, cut the grapefruit halves into quarters and squeeze the juice into a mason jar. To make the raw sugar syrup infused with mint, mix 1 cup raw turbinado sugar with 1 cup water in a small pot with 8 mint leaves, and heat the mixture until the sugar dissolves. Strain into a mason jar and let cool before using.